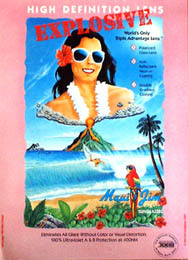 Maui Jim Sunglasses were pioneers in polarized sunglasses. They soon found that water sports were one of the best markets for their products. When Surfing Magazine asked to feature their product in a special travel adventure, Seal designed both ads and this point of purchase poster to accompany the promotion. The poster features an airbrush painting and the Maui Jim Logo that Seal also designed.